ABIM staff met with hundreds of physicians during spring medical society meetings. We thank everyone who participated in one-on-one and small-group conversations, attended presentations and visited the ABIM booth. These were all wonderful opportunities to continue dialogue and listen to your input. Additionally, ABIM Specialty Board members joined presentations, panels and meetings with society leadership. These important touchpoints allow us to hear directly from physicians and societies, provide timely information and enable us to be more responsive to the needs of the internal medicine community. As we had last fall, at seven society meetings this spring, ABIM held a number of focus group-style Discovery Sessions that brought physicians together to discuss potential changes to the Maintenance of Certification (MOC) assessment. Participants responded with passion and thoughtfulness, sharing their individual experiences in practice and in approaching assessment. Their insights and ideas are invaluable as the community works to reimagine assessment. Whether it’s hearing from a certified physician who is balancing the responsibilities of practice with the challenges of moving his young family cross country or a veteran practitioner who is considering which direction to take into the next phase of her career, diplomate input helps shape ABIM’s next steps by providing key insights and learnings that can be shared with ABIM leadership and governance. Input from these sessions reflected what we have heard in a number of other ways: Align MOC with the thousands of activities physicians are already doing such as participating in CME conferences, engaging in self-assessment activities, reading medical journals and assessing what they actually need to know and do in practice. We know physicians want to gain value from the MOC process and not feel overly burdened by it. We are working closely with our society partners to identify additional engagement opportunities, including events at several society meetings this fall. We’ll provide more details about those opportunities soon and look forward to discussing the latest assessment ideas under consideration. 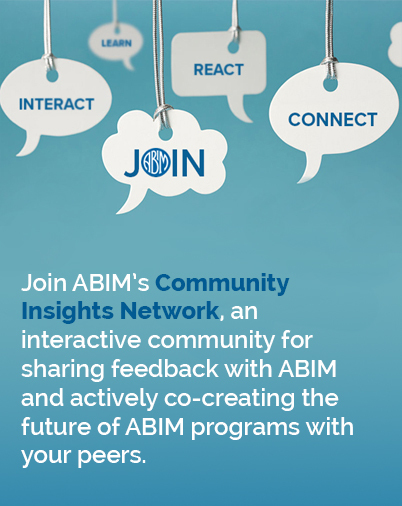 As this work moves forward, I encourage you to reach out to ABIM with your ideas, subscribe to the Transforming ABIM blog and sign up for opportunities to get involved.